What is ClearSkin-E Eczema Cream? How has ClearSkin-E Eczema Cream helped others? How do I use ClearSkin-E Eczema Cream? Eczema is an inflammation of the skin and may be associated with an allergic reaction, although the cause is often unknown. Childhood eczema is sometimes found behind the knee or in the bend of an elbow and will often clear up by the time the child reaches puberty. Eczema affects more than 15 million Americans and ten percent of all children have eczema. Eczema often runs in families and may be exacerbated by stress or contact with certain chemicals or other allergens. Atopic Eczema. The most common of all eczemas is Atopic Eczema which is often present along with asthma and hay fever. People of all ages can be affected, but there seems to be a trend for it to run in families. A common symptom is itchiness that can become very uncomfortable. The skin has an overall dryness, can become very red, and highly inflamed. Persistent scratching only worsens the condition and can cause skin infections. If infected, the skin can weep and have cracks in it. NB! Skin hydration must be maintained. Allergic Contact Eczema results when the body has a reaction to skin contact with a substance that the immune system finds unacceptable. The reaction may be immediate, or can develop over an extended period of time. Some of the typical substances are nickel, perfumes, cloth, rubber, and tin. Some of these substances may be found of the commonest of items, such as rings, buckles, buttons on clothes, watches, and other jewelry. Irritant Contact Eczema is caused by contact with substances that could be encountered daily, such as soaps, certain chemicals, and detergents. Hairdressers and beauticians often find themselves with rashes and inflamed skin. As with atopic eczema, keeping the skin moist can help in preventing an outbreak. Herbal products, unlike remedies containing drugs, can be used often during the day without any adverse side affects. Infantile Seborrhoeic Eczema can be very common for children under 1 year of age. The reason for this condition, also called cradle cap is not fully understood. While it is not considered to be serious and causes the baby no unwell feelings, it can be treated with herbal products to help clear the condition. It usually lasts only a few months. See our safe and effective BabyNature Cradle-Cap Salve for natural treatment on infant cradle cap. Adult Seborrhoeic Eczema can be more serious than the infant version. It can be found in the scalp and can spread to the face, ears, neck, and chest. The skin becomes inflamed, red, and can flake. Varicose Eczema is a condition found in the lower leg. People in their middle to late years are found most likely to encounter this eczema. Poor circulation is suspected. The ankles are most often affected and if the skin is left untreated, ulcers can develop. Typical treatment is an emollient, especially one that can improve the general health of the skin. Discoid Eczema most often occurs in adults. It appears as a small, coin shaped redness of the skin. Most often it is found on the trunk or lower legs. These can erupt or weep. Emollients are a usual treatment, but care should be taken that the skin does not become infected. Treatments for eczema are like political opinions; there are many, many of them! Conventional treatment for eczema usually involves the use of cortisone products to treat inflammation and reduce pain and infection. Cortisone and steroid-based products are known to have many side effects and should be avoided if at all possible, especially in the case of children and infants. Apart from their known negative effects on systemic health, the effectiveness of cortisone treatment tends to diminish over time, resulting in a need for stronger more aggressive treatment as time progresses. Beating eczema is not just about applying a cream or taking a drug. The best chance of success involves a holistic program involving symptomatic treatment as well as lifestyle intervention and stress management. Natural products containing herbs should be used instead of steroid-based cortisone products. This approach helps to support skin health, helping to prevent eczema outbreaks as well as to treat the symptoms. Feelgood Health ClearSkin-E Eczema Cream has been developed with care by our practicing Clinical Psychologist, is 100% natural, safe, and manufactured according to the highest pharmaceutical standards. Individual ingredients are well-researched and have been put to the test over the years as a complement to the treatment of real people with real problems. Secondly, an obvious plan is to stay away from substances that cause reactions. Keep the skin as healthy as possible. When bathing, use soaps that are not harsh to the skin. Our FeelGood Health ClearSkin Daily Wash is an excellent alternative to ordinary soap for keeping skin clean. The ingredients in ClearSkin Daily Wash are also known for their beneficial effects on skin health, further assisting in the prevention of skin problems like eczema. Diet is very important. Some common foods known to contain allergens that can aggravate the body are daily products such as milk, cheese, ice cream, and yogurt. Eggs should be avoided. Crustacean meat should be greatly reduced or avoided altogether. Lobster, shrimp, squid, prawns, clams, oysters, and other crustaceans can cause allergic reactions. Salmon should also be avoided along with calcium supplements and color dyes, especially Yellow #5. Additional allergens are products containing NutraSweet. Mushrooms can sometimes cause reactions to eczema patients and should not be eaten. Hot, spicy foods can cause intestinal inflammation which can cause outbreaks of eczema. PureCalm stress and anxiety drops to calm nerves and relieve stress. Herbal Immunity Plus drops to support immune functioning, promote healing and prevent infection. Skin Dr. - tonic containing selected biochemic tissue salts and herbal ingredients to promote skin health and assist in the treatment of all skin disorders. ClearSkin-E Cream has been especially formulated using natural ingredients especially chosen to soothe the skin and support skin health. 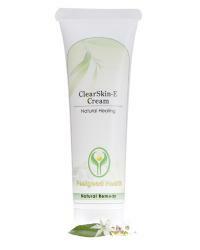 Regular use of ClearSkin-E Cream will help to maintain healthy, trouble-free skin all over – the natural way. This gentle, yet effective formulation is safe to use for all ages, including babies. It is recommended that ClearSkin-E Cream be used together with our Skin Dr. to promote skin health from the inside as well as the outside. Using these two remedies together gives you the best chance of success and helps to ensure long-term results. "My child is four years old and has suffered from eczema almost all his life. He is always miserable and itchy and I really believe that the eczema is affecting his self confidence and development because he is unhappy all the time. Your Eczema cream really helped to soothe the redness and take away the itchiness. At least he is sleeping at night without waking up and he cries much less now." "I used to have bad eczema as a child but it cleared up nicely. Now I only get it when I am stressed or when my skin comes into contact with some cleaning chemicals. When it flares up I use your eczema cream straight away and it soon goes away - thank you for making a product that works!" ClearSkin-E Eczema Cream is a unique combination of both herbal and homeopathic ingredients. Vitamin E is added to maximize the healing process. Vitamin E oil – wonderfully nourishing and therapeutic for the skin and proven to help keep skin supple and soft. Peppermint essential oil – all essential oils are great at fighting bacteria and keeping skin flora healthy. Bulbinella (Bulbinella frutescens) is a herb indigenous to Southern Africa and used traditionally in support of skin health in general. Bitter aloe ferox (Aloe ferox) has been researched for its ability to help aid the treatment of psoriasis. Aloe is also extremely soothing on the skin and delicate irritated areas associated with eczema. Licorice (Glycorrhiza glabra) - This herbal ingredient has been studied for its properties to soothe and address atopic dermatitis resistant to conventional treatment. Neem (Melia azadirachta) - extracts of neem leaves have been used with positive results for the treatment of psoriasis and skin conditions. Elder (Sambucus nigra) - for skin integrity and health, this herb is well known, gentle and effective. Chickweed (Stellaria media) - This herb has been researched for its ability to soothe the skin when allergic contact dermatitis, atopic dermatitis and non-allergic chronic inflammatory of the skin is present. Chamomile (Matricaria chamomilla) has been extensively researched for its soothing effect on the skin, especially as a topical application. Chamomile is also one of the best natural soothing ingredients when skin is ‘angry’ and bothered. Rooibos (Aspalathus linearis) has been researched for its immune supporting properties and will support the skin from the inside out. Cleavers (Galium aparine) has a great ‘cleansing’ effect on the skin and helps to detoxify the body. Simply apply to affected areas twice daily for fast and effective relief. Remember to use ClearSkin-E Eczema Cream at the very first signs of an eczema outbreak. Because ClearSkin-E Eczema Cream hydrates and soothes the skin, there will be an almost immediate relief from irritation, itching and discomfort. Continued use will reduce the eczema patches until they disappear or are greatly reduced, depending on severity. ClearSkin-E Eczema Cream will also help to prevent infection caused by scratching. Use our Skin Dr. tonic along with ClearSkin-E Eczema Cream to treat eczema from the inside and the outside. Each tube of ClearSkin-E Cream is 50g and will last approximately 3 weeks, depending on the size of the area covered.